It's amazing what a couple of games can do for a player in the hobby. After slamming a pair of home runs in his second game with the Dodgers, Yasiel Puig baseball cards are on fire. There might have been even more heat, though, if he had more cards available. Although there is no shortage of Puig cards, the overall number of options isn't as big as many collectors have come to expect in recent years. That's bound to change in a big way very soon, but for now, collectors will have to settle for what they can find. 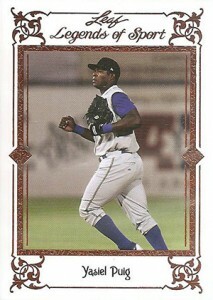 Click here to see the first official Yasiel Puig rookie card from 2013 Topps Allen & Ginter Baseball. Born in Cuba, Puig signed with the Dodgers as a free agent in 2012. 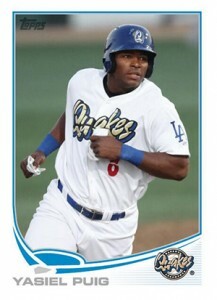 Leaf is the only company to make Yasiel Puig baseball cards during his first season as a professional. The company included him in several sets, including several autographs. 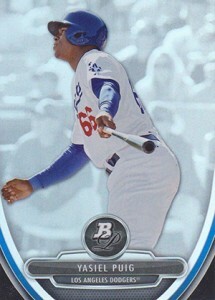 Puig's first cards to feature him in a Dodgers uniform are a pair of inserts in 2013 Bowman Baseball. He's also got a Lucky Redemption card good for an autograph. 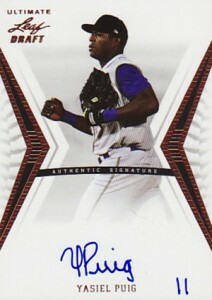 Topps has already announced Yasiel Puig autographs are coming in future Bowman products. 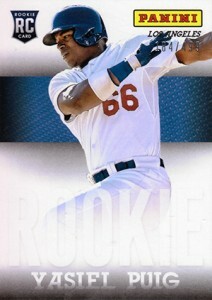 Collectors can also expect official rookie cards in the near future as Topps also confirmed he will be in all 2013 products beginning with Bowman Inception. 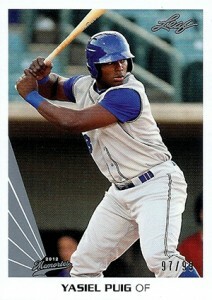 Panini has also said they're adding Yasiel Puig cards to the 2013 Pinnacle and 2013 Panini Prizm checklists. But until then, here's a look at what you can buy right now. Below are highlights of the top Yasiel Puig baseball cards already on the market. 2012 Leaf Legends of Sport is mostly about autographs and retired greats. 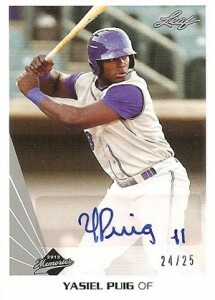 However, Puig was included as one of only a handful of base cards. Although not numbered, the card has a confirmed print run of 70 cards. Numbered to 99, the 2012 Leaf Memories Originals Yasiel Puig takes on the 1990 Leaf Baseball design, which is one of the most popular sets of the era. For those who prefer licensed sets, this is one where the lack of logos is clear. That said, the tradeoff of limited availability is appealing to many. 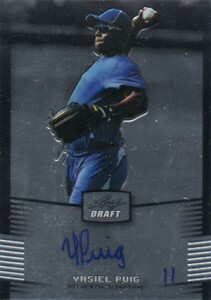 The 2012 Leaf Memories Originals Yasiel Puig autograph is an odd mix of nostalgia and prospecting. While the design pays tribute to 1990 Leaf Baseball, there's nothing old-school about a young prospect. The signature is on a sticker, though the limited print run of 25 numbered copies is a major selling point. Chromium has long be a collector favorite, particularly with prospectors. That's exactly what the 2012 Leaf Metal Draft Yasiel Puig offers. The card, which is a short print in the release, has an on-card signature. 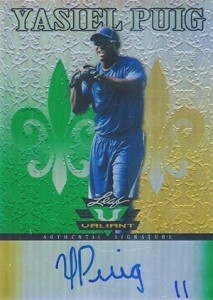 The 2012 Leaf Ultimate Draft Yasiel Puig autograph is a solid choice for those who don't want a lot of flash. It opts for a lot of white space over pizzazz and fancy technology. A throwback to the Crusade inserts of the late-90s, the 2012 Leaf Valiant Yasiel Puig mixes texture, a Refractor shine, nostalgia and color. It's hard-signed and has several color-based parallels. 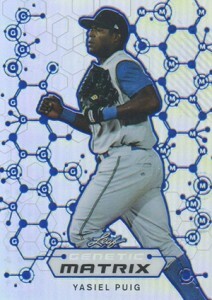 Although Yasiel Puig isn't on the 2013 Bowman Baseball Prospects checklist, he does have a Bowman Chrome mini card in the product. It's printed as a Refractor. Parallels include Blue (#/250), Red (#/5) and Superfractor (1/1). Without any base cards, this is one of the most popular Yasiel Puig insert cards as it's one of the first to show him in a Dodgers uniform. One of the most intriguing aspects of 2013 Bowman Baseball is the Top 100 Prospects insert set that counts down the best young players in the game. The cards themselves may not carry a ton of value, but they are informative. A Die-Cut Refractor parallel is numbered to 99. Right now, this is about as plain and unexciting as it gets. The redeemed card will have on-card signature done in the Blue Sapphire Refractor design. This has become the outfielder's hottest early show, topping $500 following his Dodgers debut. Although a redemption, the 2013 Bowman Inception Yasiel Puig Prospect Autograph should be one of his more popular early cards. All Prospect Autographs comes with a distinct design that's very striking. Besides the basic version that is not serial numbered, the card also has several color-based parallels. 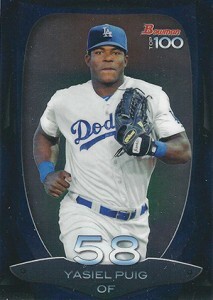 2013 Bowman Platinum Baseball is the final mainstream set to have Yasiel Puig before an official rookie card. Released a week before 2013 Topps Allen & Ginter Baseball, the set with his first official MLB rookie, the Bowman Platinum Yasiel Puig is part of the Prospects insert set. It has several parallel versions to add to the chase. 2013 Leaf Rookie Retro is focused largely on the high-end buybacks, each box also includes one Genetic Matrix card. Covering multiple sports, Yasiel Puig is one of the most prominent names on the checklist. The cards are highlighted by new colored etching technology. Besides the basic version, the 2013 Leaf Rookie Retro Genetic Matrix has four colored parallels. Every year, Panini puts together a promo set used for wrapper redemptions. The Yasiel Puig from the special release is part of the Rookie subset. The basic version is numbered to 499. A Lava Flow version is numbered to 99. There's also a rare Cracked Ice version. 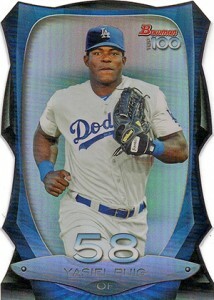 The 2013 Topps Gypsy Queen Yasiel Puig wasn't available in packs. 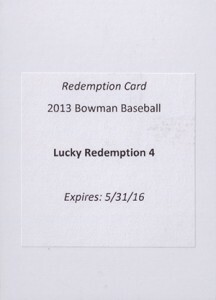 Rather, it was a special redemption at the 2013 National Sports Collectors Convention in Chicago. A total of 100 were given away each day to collectors who opened a box of 2013 Topps Tribute World Baseball Classic at the Topps booth. The event lasted five days, meaning 500 copies were given out. Although straight-up minor league cards from Topps don't normally carry a lot of clout, this card was selling very strongly upon its initial release. While it might still be a popular choice, this is likely to slow down once official rookie cards start to appear. Besides the base version, there is also a Gold parallel that is numbered to 50. 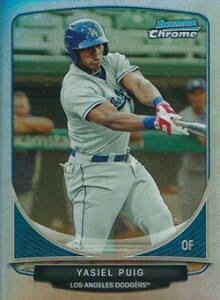 The most valuable Yasiel Puig card in 2013 Topps Pro Debut, though, is his variation short print. There are 15 cards in the set with individual cards landing less than one per case. You didn’t put any of the Leaf Rize cards in the article. They seem to be the most prolific with lots of auto parallels. What’s with the Rize anyhow? Didn’t see any boxes on ebay. Bob Patterson � Rize was a retail release last year. While they are viable, over the long-term the cards listed should have much greater appeal. That said, those looking more for an autograph rather than something that may appreciate in value, Rize fits the bill. Do you think the Leaf 552 card will be a good card. Will it be considered one of his rookies. I want to buy a card to put away for my son. God bless. Does the #552 appear in any price guides. What value would you put on it. Keep up the good work. God bless. Alder Jeff � While not an official rookie card, it is proving to be very popular. Not sure if it’s in a print price guide. It should be. However looking up closed auctions on eBay will give you a better idea of what a card is selling for at any given time. Puig’s rookie cards will be coming out later this year. All of his cards out so far are either from sets largely viewed as minor league/prospect sets or inserts. By the end of the year there will be rookie cards in several price ranges. So the 2013 Bowman boxes that are still remain in TARGET stores should carry a significant value as well once they clear the store shelves??? 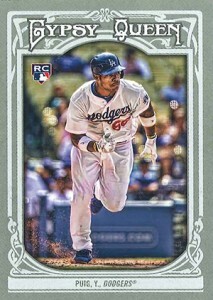 Would Puig’s Bowman Cream of the Crop Mini “Superfractor” be his most sought after/Chased Card? Would it carry the value of say the 2010 Strasburg Superfractor that sold for over $20,000??? Nate � Currently, probably, but within the next couple of months many other cards will be coming out. Values are tough to predict for stuff like this as not a lot of people can spend tens of thousands on a card. All it would take is a couple of people to send the price high, but if they don’t show, it might not reach the same heights. It’d get a lot of attention though. quick question on the leaf legends of sport #10.. this article lists the card as not #’ed and a print run of 70.. one just sold on ebay graded by beckett and #/10 from probstien123. they have 100% positive feedback and over 100K feedbacks. any clarification would be awesome. Eric M. � Silver parallel.There’s also a Gold #/5 and a Purple 1/1.